As you know, my little brother Scruffy has been visiting again. Well, the other day, mom came home with a surprise for him. She knows how much my Brother T wants a dog. He really is so busy and not home enough to care for one right now. She also knew that Scruffy shares the same dream. So, when she had what she's calling "the puppy adoption option" with her Happy Meal*, she knew just what to do. She thought Scruffy should be the one to have him. from Brother T. So Scruffy posed for this picture then emailed it off to Bother T, who was away on a business trip. Can I keep him? Please can I keep him? We've been trying to decide on a name for him. Grandma suggested Spot. We thought that would be a good name for him, for a day or so. We spent a rainy afternoon coming up with some more names and playing with the puppy. Cocoa suggested Pirate, because he has an eye patch like a pirate. Then Buster came over from grandma's house to spend a few days. He suggested that Scruffy name his puppy Patch or Patches. Then I came up with Spy. Scruffy told every one he couldn't decide on a name till Brother T emailed back as to him keeping the puppy. That very night Scruffy got permission to keep the puppy. He was so excited! 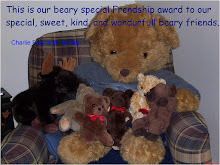 Then Scruffy heard that our friends Charlie Bear and Taddy are having a cutest bear and pet contest. 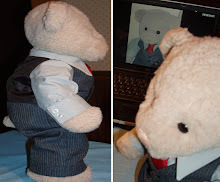 Charlie asked for photos to be submitted of dogs and cats with their favorite teddy bears, teddy bears with their favorite dogs or cats. So, as soon as he knew he could keep the puppy he wanted a picture taken to enter in Charlie's contest. He thought he qualified for the contest because he is a cute bear with a cute dog. So please go and VOTE for Scruffy and his darling little puppy. Just scroll down till you see Scruffy's photo on the left side column with the place to vote and vote. The 1st and 2nd place winners will have a monetary donation made in their name to the Atlanta Humane Society and a dog toy sent to their home as a token prize. Scruffy sent Brother T the names we came up with. He liked Patch, so Patch it is. We all liked that one too. The other day we all went outside to check out the old old laundry sink that's to be replaced; and the new basement door that was being installed. There was an interesting label on the end of the sink that had been up against the wall. Hee hee, it says never wash dishes in tray, they called it a tray? Guaranteed only for washing clothes. My house was built in 1957, so that's a long time ago! It was so beautiful out that mom let us stay out for a little while to enjoy the neighbors maple tree. This is our burning bush, mom started it from a teeny tiny sprout, it came in a box. You always wonder if they will live. Last year it was redder. Yeah, a new door after 29 years! By days end the new door was in, dad just had to install the deadbolt lock. Hee, hee, look there's mom's onions. The plan is to finish this utility room, it has never been done. Mom is going to make a curtain for the window. Young puppy Patch will certainly keep Scruffy on his toes. I have six pups in my hug and that does not include the two 'wheelie' ones - it means a LOT of walking!!! Maybe I should enter the photo competion too, after voting for Scruffy of course. That Scruffy know my dog Scoots? They can have theyselves a playdate, LOL! Nothing like a puppy to add some excitement! Y'all are very cute. Do y'all have halloween customs yet? Taddy and Charlie aren't sure what to wear. Charlie is very excited about the teddy bear contest. Thank you for telling everyone about it.